Over the last three months, I’ve been reaching out to many of the terrific alumni and friends of this great school. 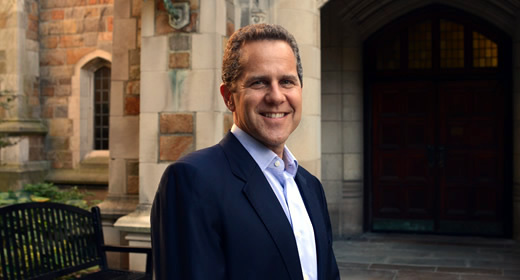 For those I haven’t yet met, and to my distinguished colleagues at policy schools and public administration programs around the world, let me introduce myself as the new Joan and Sanford Weill Dean of the University of Michigan’s Gerald R. Ford School of Public Policy. While I’m new to the role of dean, I’ve worked with a number of Ford School faculty over the years, having joined the faculty of the University of Michigan Law School in 2001. Since then I’ve worked collaboratively with colleagues from the Ford School, the Institute for Social Research, and other world-class U-M schools to conduct empirical research—primarily on the significant financial challenges faced by the poor. What I’ve long admired about the Ford School is how dedicated the faculty members are to working across disciplines to understand and solve vexing social challenges: improving access to higher education, overcoming poverty, reducing health disparities, taking on climate change, strengthening municipal finance, and so much more. It’s no revelation to say that these are challenging times for our communities and our world. Fractious political discourse, gridlock and partisanship in our nation’s capital, an increasing mistrust of institutions everywhere, and vocal challenges to the kind of evidence and expertise that public policy schools advance. In this climate, programs like ours are more critical than ever in helping our nation find its way past the partisan rancor, the rejection of facts—an important role to play in rebuilding bipartisan, evidence-based policy, and an inclusive and civil, civic dialogue. Here at the Ford School, that good work is deepening and broadening as we build both our faculty expertise and our momentum. I hope you enjoy reading this selection of stories from among the many ways in which Ford School faculty, alumni, and students are working to make our world a more peaceful, just, and inclusive place.